A resistor is a device that limits, or resists current. Resistors can be made from many different materials, but the most common is carbon composition (graphite plus binding agents). The carbon composition resistor is basically a small, thin section of carbon composition with a lead at each end. The current limiting ability, or resistance can be varied at manufacture by changing the ratio of carbon to binding agent. Note that more details on unit prefixes are available in a Starting Block article here. Sometimes, to shorten things even further, people will drop the "W" entirely (so "1 KW" would become "1 K", etc.). A few get even more cryptic and use the prefix as punctuation -- so in this scheme, 4.7 KW would be written as "4K7". Variable resistors have a dial, knob, or screw that allows you to change their resistance. The value of a variable resistor is given as it's highest resistance value. For example, a 500 ohm variable resistor can have a resistance of anywhere between 0 ohms and 500 ohms. A variable resistor may also be called a potentiometer (pot for short). Photoresistors, as their name suggests, are resistors whose resistance is a function of the amount of light falling on them. Their resistance is very high when no light is present (up to millions of Ohms), and significantly lower when they are illuminated (hundreds of Ohms). These are also often called Light-dependent Resistors (LDRs) and Cadmium-Sulfide (CDS) cells. Resistors are marked with their resistance values in some more-or-less cryptic fashion. 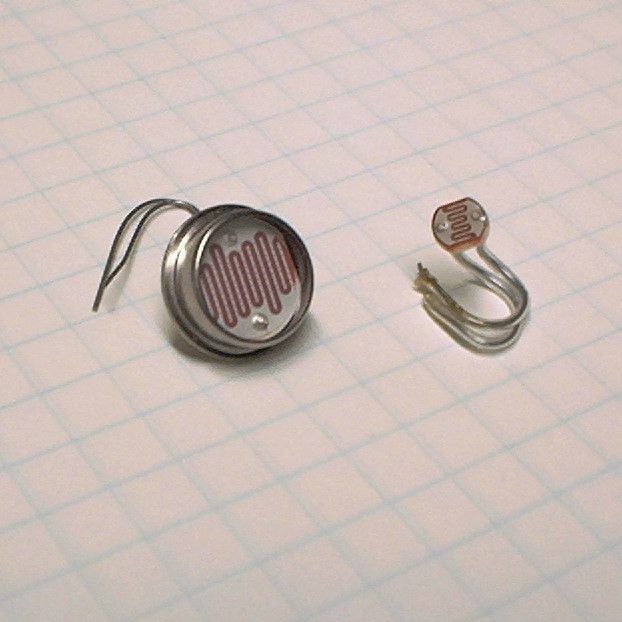 Most resistors are marked with color codes; surface mount resistors have their own, unique marking scheme. I have a writeup on resistor usage in BEAMbots here; this includes more details on resistor markings. Meanwhile, SatCure has a resistor tutorial here.